Plants annual. Culms 10-70 cm, decumbent, branching and rooting at the lower nodes. Sheaths compressed, glabrous or pubescent; ligules 1-2.1 mm; blades 2-14 cm long, 3-14.2 mm wide. Panicles 2-8.2 cm; fascicles 9-16 mm long, 4-8 mm wide, imbricate, ovoid, densely pubescent; bristles 15-43; outer bristles usually present, flattened or terete; inner bristles 4-8 mm long, 1.2-3 mm wide, fused for at least 1/2 their length, forming a distinct cupule, the distal portions diverging at irregular intervals from the cupule, stramineous or purple. Spikelets 1(2) per fascicle, 6-8.8 mm. Lower glumes 1-4 mm; upper glumes 4.9-6.8 mm, 3-7-veined; lower lemmas 5.5-7.5 mm, 3-7-veined, enclosing the palea; upper lemmas 6-8.7 mm; anthers 0.8-2.8 mm. Caryopses 2.6-4 mm long, 2.2-3.1 mm wide, ovoid-elliptic. 2n = 34. Cenchrus tribuloides grows in moist, sandy dunes and is restricted to the eastern United States. 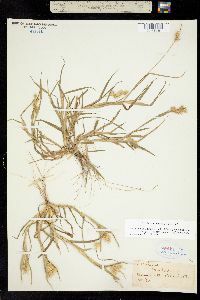 It differs from C. spinifex in its larger spikelets and smaller number of spikelets per fascicle, and from C. longispinus in its densely pubescent fascicles, fewer bristles, and wider inner bristles. Stout, much branched, decumbent or trailing annual 2-10 dm; sheaths villous at the summit and ±villous-ciliate; blades 2-14 cm נ3-14 mm; burs densely villous, 9-16 נ4-8 mm (spines excluded), with mostly 15-40 basally flattened, distally retrorse-barbed spines 4-8 mm; spikelets 6-9 mm, 1(2) per bur and concealed in it; 2n=34. Coastal sands, especially on dunes; s. N.Y. to Fla. and Tex., and rarely in trop. Amer.